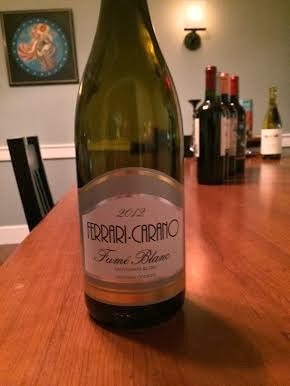 Our first bottle is the 2012 Ferrari-Carano Fume Blanc. Father Clifford remarked after its viscosity; Meghan and Liz were taken with its comely "mouthfeel." Randy enjoyed it, noting pensively that it is both rich and heavy. He agrees with Bobby that one can readily detect pineapple, citrus, and it's a bit grassy. Randy noted it was a bit rococo: very rich, oaky, nothing at all austere. A tad over the top. Sean thought he detected hints of saddle leather and must. We were puzzled, of course, until we saw that he was licking his shoe. We can't speculate on how this came up, of course, but we quickly replaced the shoe for a glass.